To visit the homes of two Catholic movements, today, May 10, 2018, Pope Francis visited Nomadelfia and Loppiano. 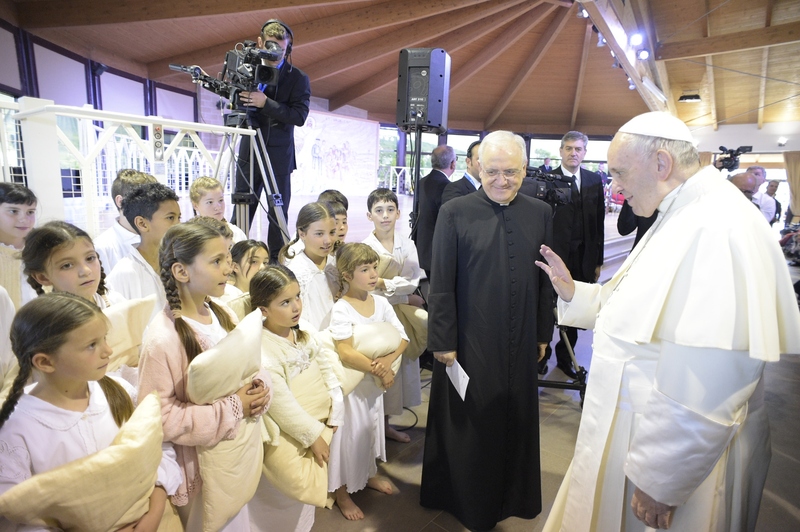 This morning, the Holy Father made a half-day pastoral visit to Nomadelfia, marking his 22nd pastoral visit in Italy, in the province and Diocese of Grosseto, where he met with the Community founded by Don Zeno Saltini, and to Loppiano (Florence) in the diocese of Fiesole, where he visited the International Town of the Focolare Movement. This morning, the Pope took a helicopter to Nomadelfia, named after a Catholic community, following in the footsteps of St. Pope John Paul II who visited the same town on May 21, 1989. Upon arriving, the Pontiff visited the tomb of Father Zeno Saltini, who in 1948 founded the community. The Holy Father visited one of the family groups, held a meeting with community members in the Church, met young people and delivered an address. In the Nomadelfia Community, all goods are shared and there is no private property. Inspired by the first Christians in the Acts of the Apostles, the families and lay unmarried people of the community adopt a lifestyle of brotherhood. After Nomadelfia, Pope Francis flew near Tuscany’s capital of Florence to Loppiano, where in 1964 the first international center of the Focolare Movement was established. After landing, the Pope first prayed at the Maria Theotokos Sanctuary, in the Focolare complex. Outside the sanctuary, Francis met the community and responded to questions from members. After greeting a delegation of the Focolare, the Holy Father flew back to Rome. Active in 194 countries, the Focolare is an international movement based in Italy that promotes “the ideals of unity and universal brotherhood among all people.” It was founded by charismatic lay Catholic woman Chiara Lubich in 1943 in the northern Italian city of Trento. This marked the first time that a Pope visited Loppiano. The Holy See’s first recognition of the Movement dates back to 1962. Two years later, Paul VI received Chiara in audience, the first of innumerable meetings that followed with Popes Paul VI, John Paul II and Benedict XVI and different realities of the Movement. Today the town has become home to almost 1,000 persons of every age, race, social extraction and religion. In addition, every year it welcomes thousands of visitors. Moreover, Loppiano is the headquarters of an agricultural cooperative and of an entrepreneurial ensemble of 25 companies operating according to the principles of fraternity and solidarity. In 2004 the Shrine of Mary Theotokos was erected, which also houses an ecumenical Chapel in the Sophia University Institute. Following from the experience of Loppiano, there are an additional 24 towns worldwide.